I stopped watching the news exactly 9 years ago this very month. It was late January, 2009. An unprecedented presidential election had recently taken place and the Inauguration coincided with what became known as the Great Recession. The stock market had fallen, the housing market had imploded and millions of people were laid off from work. For the first time in my life, I had friends and family filing for bankruptcy or foreclosing on their homes. It was a dark period in our history and in those days, I didn't have the gift of a regular yoga practice to help me cope with all the doom and gloom. So I went about my days feeling stress, fear, anxiety, and depression fueled on by a steady stream of 24 hour news. Then one afternoon I had lunch with a friend. She sat at the table looking lovely and relaxed (even with four kids waiting at home!). I sat at the table with an aching jaw (from grinding my teeth at night) and bags under my eyes (from lack of sleep). Upon noticing my sullen pout, we talked and she made a simple suggestion that changed my life; "Unplug...and stop watching the news!" Immediately, questions went off in my head. Can it be that easy? 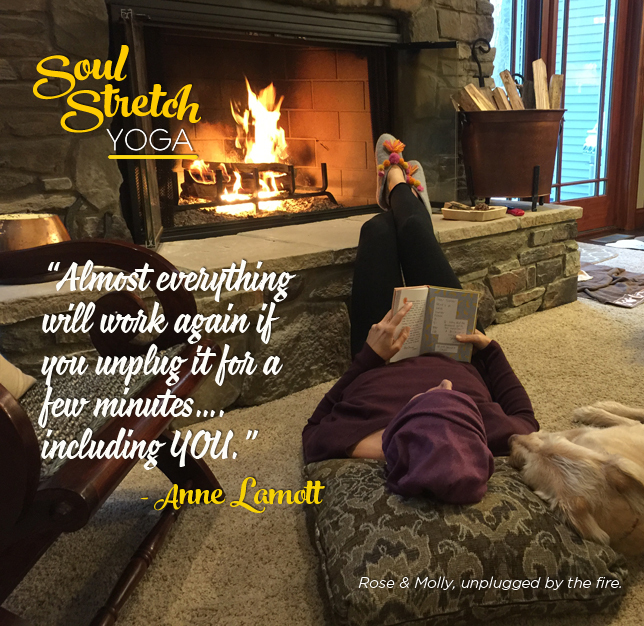 Can I simply UNPLUG - from news and all media - and feel lighter, happier, free again? It was a radical idea, but I was tired of feeling fatalistic. Fed up with looking over my shoulder, waiting for the sky to crash down on my head. So I unplugged from everything....TV news, cable news, newspapers and internet surfing. It was difficult at first. After all, I was extremely addicted to the "white noise" and needed time to detox from a diet of constant negativity. Then, around 2010, something beautiful happened. I got my happy grove back! I smiled more, worried less, became a warrior on the yoga mat as well as out in the world. My clients and business associates noticed. My family and friends made comments. Even my husband joined in on my "unplugged" movement. So powerful was my transformation once I unplugged that I decided NOT to plug into social media, at all. I even cut the cable cord, forever, in 2016. Yes, I miss Food Network - but now I have a lot more time to actually cook! English songwriter, Terry Hall, said; "It's called 'The Web' because once you're in it, you're stuck." Local writer, Regina Brett, said; "You can get sucked down the hole that is Facebook and believe the entire world is at stake every day with chaos and calamity ready to crush your every joy - if you let it." A recent study by WGSN revealed that the average American spends more than 10 hours a day in front of screens (big ones and small ones). That's significantly more time than they spend sleeping! We have an overwhelming amount of information at our fingertips. Too much! And after another year of dealing with a defeatist political culture, can you guess what screen saver images were being downloaded from Adobe Stock the most in 2017? Photographs of individuals sitting quietly in nature! Maybe people really do want to "unplug", both literally and metaphorically, to step away from all the negativity and find some peace of mind. When we disconnect from technology (even if only for a little while), we then find time to reconnect into ourselves - into our souls. I hope you choose to unplug somehow, someway, in 2018, if only for a few hours or days a week. Say no to WIFI, TV and information overload. Say yes to walking in the woods or reading by the fireplace or sitting at the dinner table with family or friends. I promise you it will be a much better connection.